In partnership with the Children’s Museum of the Arts NY, join us for Haitian folktales and songs, connecting children and families to the rich oral traditions of Haiti. Riva Nyri Precil is a music artist, dancer, author, and jeweler. When Precil was 5, she moved to Haiti where she resided for 10 years. While in Haiti, Riva was exposed to traditional Haitian music & culture, which greatly influenced her eclectic music & fashion palette. At the age of 18, Riva moved to New Orleans to attend Loyala University New Orleans where she graduated with a Music Therapy degree. During her time in New Orleans she taught several Haitian folkloric dance class, yoga, choreographed, & performed at various events and benefits functions to aid Haiti after the earthquake in 2010. She also co-founded Li! Li! Li! A reading out loud program in Creole for Haiti’s children who became displaced after the earthquake. Riva also teaches a Haitian folkloric series called Tout Se Pa in New York. Riva’s work embodies the beauty she sees in her heritage through her singing, dancing, jewelry designs and writing. 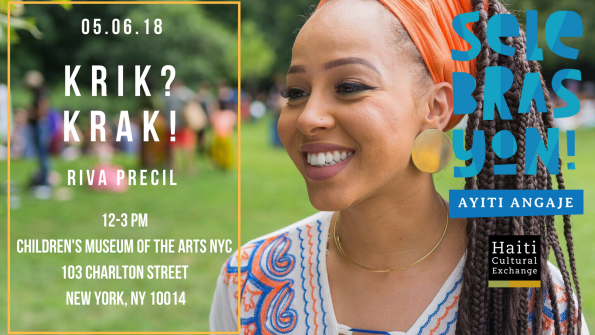 Riva continues to perform in New York City alongside her band Bohio Music. This entry was posted on Thursday, April 12th, 2018 at 1:20 pm	and is filed under Archive, Krik Krak, Selebrasyon!, Youth Programs. You can follow any responses to this entry through the RSS 2.0 feed. You can leave a response, or trackback from your own site.